Improve your paid search performance with an expert-driven lead generation SEM strategy from Wiideman Consulting Group, based in the Greater Los Angeles area. Our PPC audits and strategic plans include a thorough review of your historical AdWords data along with competitor insights at the landing page, keyword, ad and bid levels. Whether you are targeting consumers or looking for a B2B PPC strategy, our team can help. We have nearly two decades of experience helping lawyers, doctors, surgeons, accountants and professional service businesses create a program that continuously reduces both cost-per-acquisition (CPA) and overall return on ad spend (ROAS). More importantly, our strategy is always micro-focused on details that improve conversions, allowing you to grow your campaign and paid search advertising without compromising your CPA goals. Below is an example of a campaign we played a key role with in 2015. 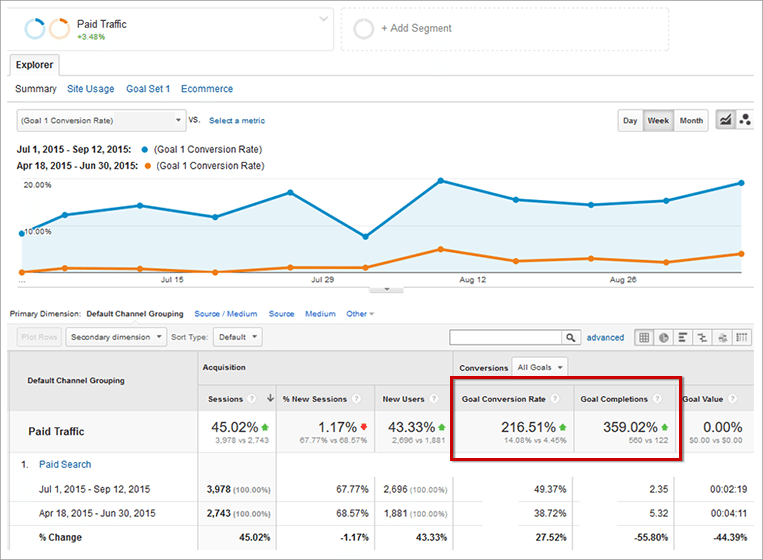 Take note of the growth in conversions, not just new visitors. What’s in a Lead-Generation PPC Plan? Unlike search engine optimization, our clients have seen results immediately after implementing our improvement recommendations. For example, it is possible that dollars are going toward geographical areas within the target region that are not generating leads. By using Location Exclusions on these areas, more dollars immediately go toward higher converting targets. Another example might be mobile ads not performing as well as desktop ads, where a simple bid adjustment can help allocate more of the budget toward desktop advertising, thereby increasing leads from paid search instantaneously. Why Choose Us to Build Your Lead-Gen SEM Plan? Wiideman Consulting Group is made up of practitioners with backgrounds in corporate and enterprise PPC, display and remarketing, having managed or having been involved with campaigns where millions of dollars in ad spend were at stake. We work very closely with direct contacts at Google, Bing, Yahoo!, Facebook, Instagram, Twitter and LinkedIn and hold those publishers accountable for our results. Reports and analytics are a core competency of ours, as is helping our clients build an easy-to-follow routine for boosting account performance over time. With our lead generation SEM strategy, you will receive copies of our report templates or assistance in improving your existing report template into a report that is actionable as well as insightful. We are certified in most bid management platforms, acclimated to Kenshoo, Acquisio and Marin Software. We also work with WordStream and other popular cross-publisher PPC platforms and can help lock down campaign name consistency, budget strategy and integrated reporting. Get started with Wiideman Consulting Group to build a lead-gen SEM strategy with industry-leading PPC Strategists. Simply contact us online (or call (562) 732-4417) for a complimentary consultation with a PPC Consultant (not a salesperson) to discuss your current performance, KPIs and overall goals.